Builders are busy people. You’ve got a lot to do in a day, so you might not have time to think about social media. But if you’re looking for more clients, free publicity and a loyal customer following, social media is a great way to get there. 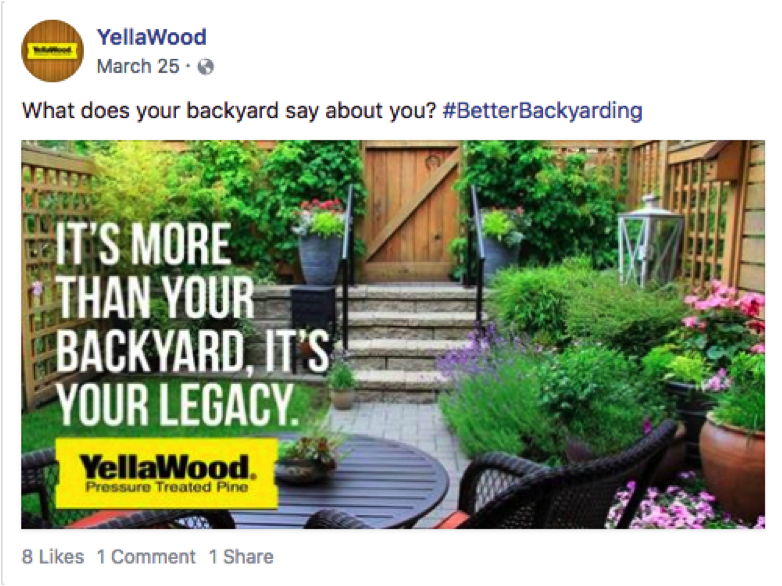 To get you inspired, take a look at these examples of how social media can help builders in today’s digital world. It’s called social media for a reason. This is your chance to show your human side and really connect with people. 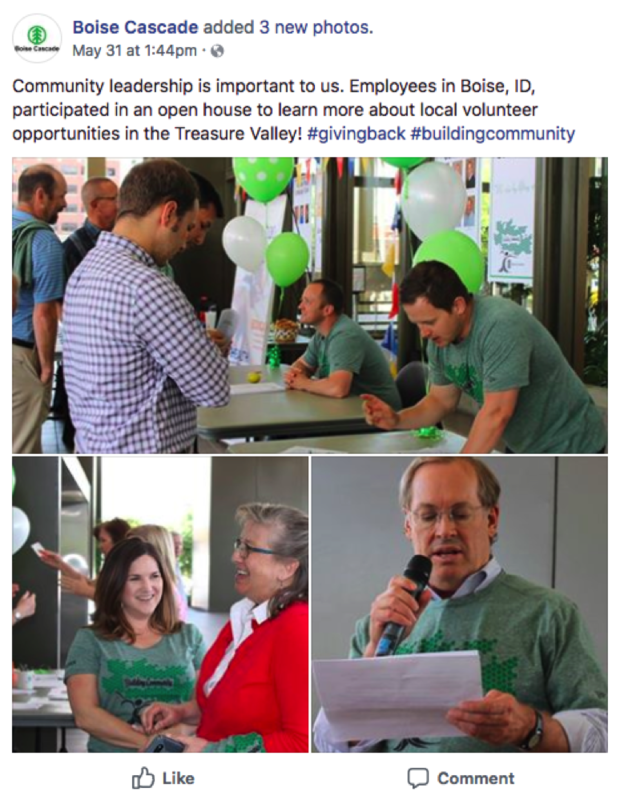 We love this post by Boise Cascade, which features company employees at a community volunteer event. We live in a world that’s increasingly connected, but not always personal. Showing your clients that your company and team are made up of real people who care and give back to their community sends an impactful message. Just finish a great-looking project? Don’t let it go to waste! Make it a habit to take high-quality pictures of your best work and showcase it on your page. And draw the process out to get the most out of it. Get good pictures of each room and keep them in a folder on your computer. On a day that you’re wondering what to post about, pull one out and post it up. 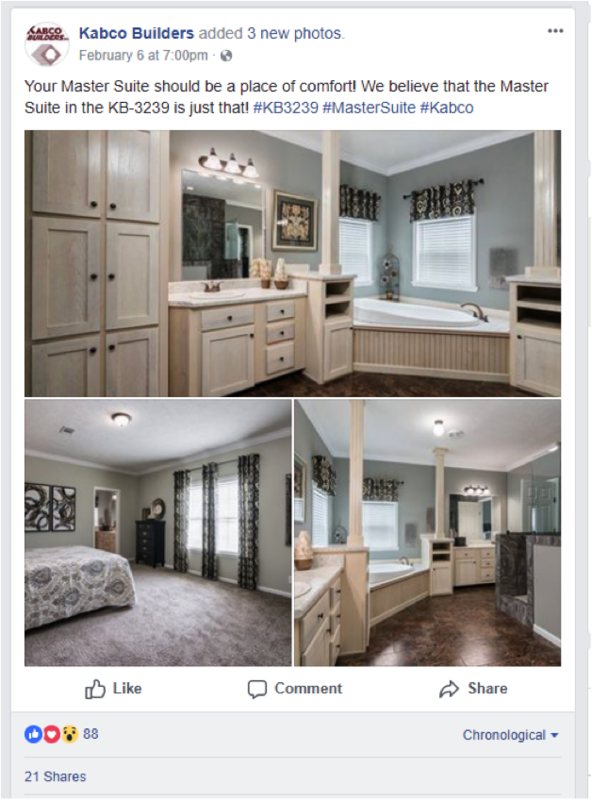 Inspiring photos and fun projects generate a lot of likes and shares — especially bathrooms and kitchens! 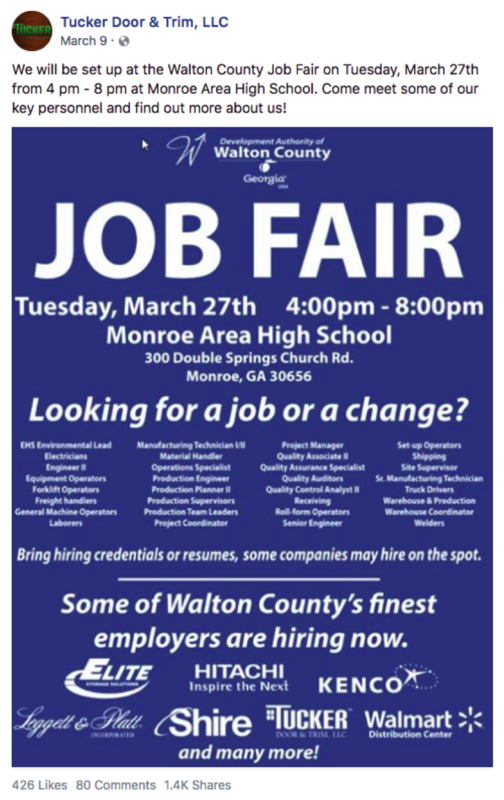 If you’ve got any events coming up (like a job fair or open house), make sure to post about it on social media. The best way to do this is to make a professional-looking graphic that gives all the details, like in the example above from Tucker Door and Trim. This can generate more interest in your page and the event. Encourage people to like and comment if they’re thinking about coming, or ask them to share with friends who might be interested. The more you can get clicks on your posts, the more successful your social media campaign will be in the long run. Social media is all about the right now — it’s a great place to show that you’re up to date on trends and what’s going on in your industry. Posting relevant articles on your blog positions you as an authority and resource for your audience. Links to these posts should then be published on social media to drive traffic to your website. 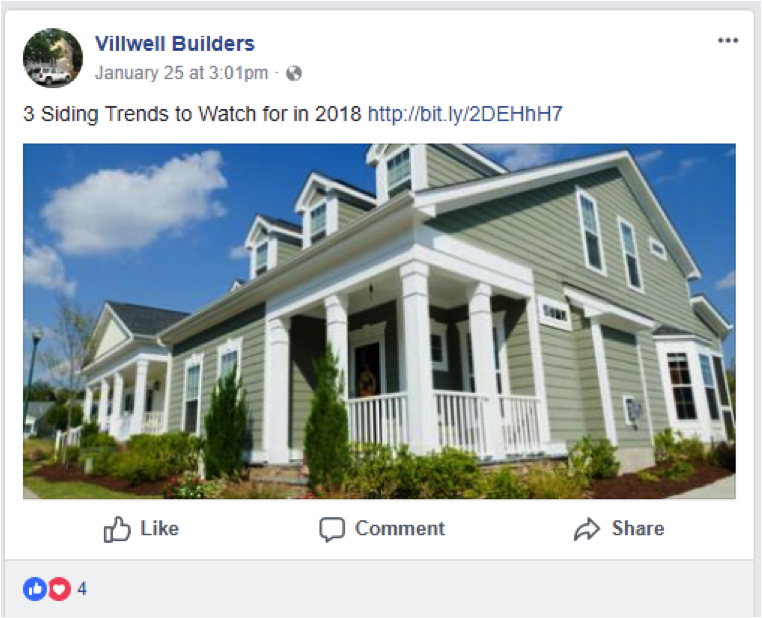 Posts like this one by Villwell Builders reassure clients that they’re on the cutting edge of new siding trends, and helps to drive more traffic to their website. Building trust with your audience should be integral to your posting agenda. A fantastic way to nurture this trust is to be proud of the community where you work and where your customers live. This post by Boise Cascade is a perfect example of how businesses can support the community around them. Notice that this post has nothing to do with a project or product — and that’s just fine. Remember, the goal of social media is to first connect with people, not sell something on every post. Social media is the perfect place to post videos and creating high-quality video is becoming easier every day. Video content can feature how-tos, before-and-afters or spotlight your favorite projects. 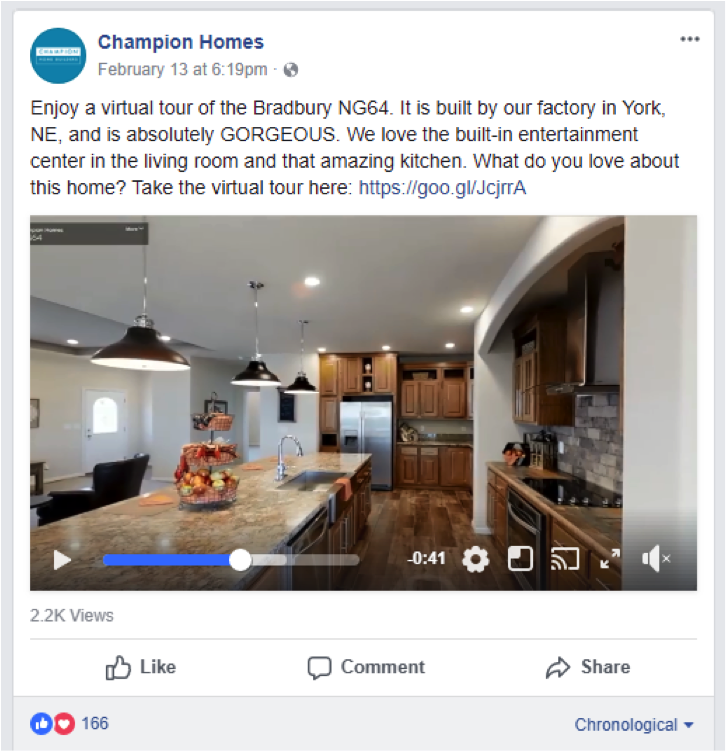 Here, Champion Homes gives us a virtual tour of a new home build, and they’re getting a lot of love for it. A huge goal for your social media posts is to get people to stop scrolling for a second and actually click somewhere on your post. Invite responses by asking a question, like this great post from Yellawood. 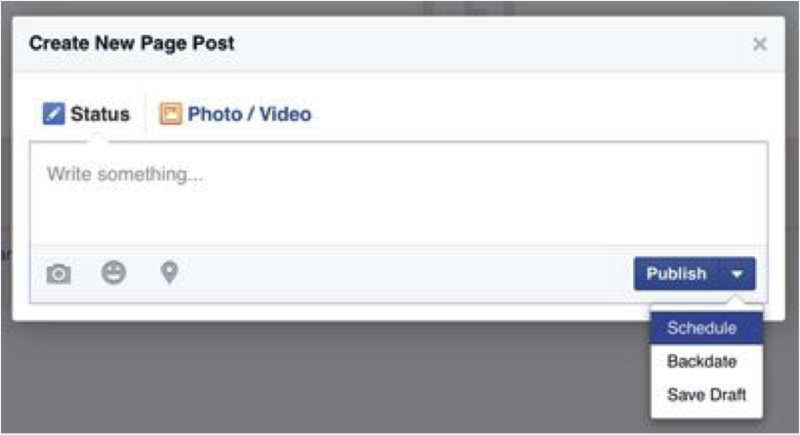 Another trick is to have people like your post for one option and comment for the other. People love voting, after all. There are hundreds of tips and tricks out there for creating awesome social media posts, but perhaps the most important is to post consistently. However, post too often and your audience may become annoyed by a cluttered newsfeed. A good rule of thumb for Facebook and Instagram is to post one to two times a day, while Twitter may be as high as 15 tweets a day. Be sure that the majority of your posts link to your website to ensure you're still driving traffic there. One of the biggest challenges with social media is keeping it fresh and new every time you post. We hope that we’ve been able to give you some great ideas for posting helpful, engaging content on your social media accounts!